CP/IND/POLL. 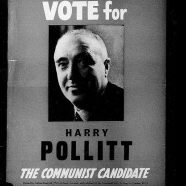 Harry Pollitt (1890-1960) was the CPGB's general secretary from 1929 to 1939 and 1941 to 1956. 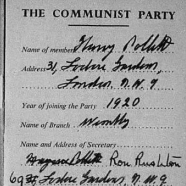 In the Stalinised communist party, the general secretary's role was a crucial one, which after the manner of Stalin himself combined oversight of the party apparatus with the projection of exemplary leadership qualities. 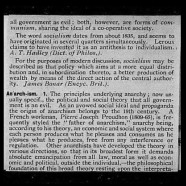 Though Pollitt took some time to establish his authority, by the mid-1930s he functioned as de facto party 'leader' and a sort of tribune of the anti-fascist left. How telling it was that when his tenure was interrupted in 1939 on account of his resistance to the Comintern's anti-war line, no other party figure attempted to combine these functions. Pollitt was therefore able to resume his old responsibilities with the Nazi attack on the Soviet Union in June 1941, and continued to exercise them until the immediate aftermath of the Khrushchev speech in 1956. His personal papers include extensive materials collected by his devoted disciple John Mahon, whose official biography of Pollitt was published in 1976. 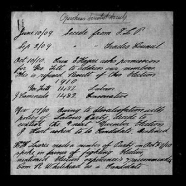 It is not always possible to identify which of the materials were kept by Pollitt and which were assembled by Mahon. 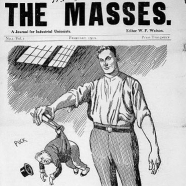 Nevertheless, the coverage goes back to Pollitt's early years before the formation of the CPGB, including documents and recollections collected by Mahon and Pollitt's own personal memorabilia. 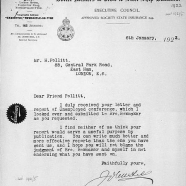 Coverage of the inter-war years is uneven, but includes substantial correspondence with Dutt from the 'Class Against Class' period, in which together they contrived Pollitt's accession to the party leadership. 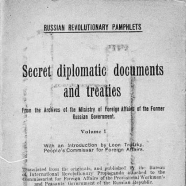 There is also an important documentation of disputes over the war and party policy during the Nazi-Soviet pact. 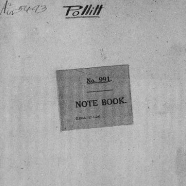 Voluminous drafts and speech notes begin in the late 1930s, and Pollitt's visits to a number of countries in the post-war period are carefully if not always revealingly recorded. There are also draft chapters and correspondence providing insight into the production of his autobiography Serving My Time. Pollitt's sixty or so trips to the USSR are not so fully documented, and for the crisis point of 1956 one must consult the files of general secretary's correspondence (CP/CENT/SEC). As if to underline the vulnerability of the archives, two letters to Pollitt have been cut precisely where they seem to promise revelation: about early party wranglings and Moscow during the purges respectively. Given the sensitivity of these questions - and, on the CPGB history commission, Pollitt was particularly cagey about the first of them - it is easy to see why Pollitt might have wielded the scissors. 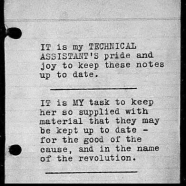 Any archive is as much as anything defined by its absences; it is rare, however, that these are so clearly indicated. 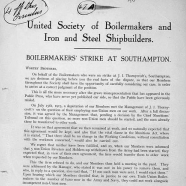 Southampton boilermakers' strike printed strike leaflet and balance sheet with TS draft of leaflet. Includes correspondence with and re the Boilermakers, Iron and Steel Ship Builders Society and its officials. 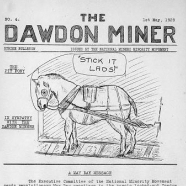 (See also, in the John Mahon working papers, File re Boilermakers Society). Includes Strike bulletins, circulars, leaflets, etc., and Workers International Relief Dawdon lockout fund account book with related papers.